Over 130 students from pre-military academies send a letter to the prime minister, calling on him to learn the lessons of the Holocaust and put an end to Israel’s policy of deporting Sudanese and Eritrean asylum seekers. On the eve of Israel’s Holocaust Remembrance Day, approximately 130 students in a pre-military academy sent a letter to Prime Minister Benjamin Netanyahu calling on him not to deport asylum seekers to countries where they would face danger. The letter was sent in the wake of several reports that revealed the State’s plan to change its policy from “voluntary repatriation” (a policy strongly encouraged by the government, which included jailing asylum seekers in Holot prison) to a policy of forced deportation of asylum seekers from Sudan and Eritrea to Uganda and Rwanda. The letter was sent by students at the Telem pre-military academy in Jaffa who recently visited Holot, where they met with asylum seekers and heard their stories. Since their visit, the students at Telem have moved to other pre-military academies, where they have taught classes about the situation in Sudan and Eritrea. “At the end of the lessons, we took down people’s contact information, and now that it was revealed that they are trying to deport asylum seekers, we turned to the same people and got their signatures for the letter,” says Shira Levi from Telem. Among the signatories are all the students at Telem, most of the students at Minsharim Kalo in Kibbutz Ma’agan Michael and students from other pre-military academies from across the country. “Over these past months, the Administration of Population and Immigration has been initiating a change in policy, according to which asylum seekers from Sudan and Eritrea will be forcibly deported to a third country under a shroud of secrecy. This move has no global precedent, especially from a democratic country that has signed on to the 1951 Convention and Protocol Relating to the Status of Refugees, not to mention a country whose history is one of refugees. This decision does not secure the protection of the asylum seekers in the slightest, and prevents them from securing their rights to life and safety. “We call on the Israeli government to immediately check asylum seekers’ refugee requests as agreed upon in the Convention and according to international standards. Our hope is that especially at this time, when we mark Holocaust Remembrance Day, the government will learn the necessary and human lessons, and will not remain apathetic to the murder happening in front of our eyes in the asylum seekers’ home countries. Asmara 14 April 2015- Eritrea’s Cabinet of Ministers held a meeting this morning at the State House. The session focused on incipient irrigation schemes as well as the extensive agricultural program for 2015 slated for implementation through traditional and modern farming techniques. In opening remarks during the opening session, President Isaias Afwerki outlined the purpose of the program drawn up to develop land productivity and enrichment of water resources, transform agricultural production into modern stage, promote land restoration and thereby ensure soil and water conservation vis- a- vis the set programs for development of irrigation farming in this year. President Isaias went on to explain in detail the enhancement of the envisaged irrigation schemes that will be implemented in three development zones in western, eastern and central highlands. The integrated approach includes development of infrastructural facilities, energy supply and related components so as to boost higher production in cereal output, fruits and vegetables. The increment development of the agro-industrial sector will constitute another vital component of the integrated approach. In this respect, President Isaias gave extensive elaboration on the concerted action that needs to be taken regarding judicious utilization of basic resources such as energy, machinery, seeds, fertilizers, pesticide, transportation, among others, apart from project management. Thereafter, the Ministerial Cabinet referred to a working paper presented by the Minister of Local Government on the Agricultural Program for 2015. The program envisages the cultivation of more than 568.000 hectares in the forthcoming rainyseason. This represents 10% growth compared to that of 2014. Following the briefings by President Isaias and the Minister of Local Government, Mr. Woldemichael Abraha, the Cabinet conducted in-depth discussions on the preparations that need to be made prior to the onset of the rainy season, including that of proper deployment of machinery, budgetary allocation vis-à-vis priorities, among others. Subsequently, the Cabinet of Ministers adopted the necessary work directives. The meeting further conducted extensive discussions on current regional and international political events and trends. Italian police on Thursday said 12 African migrants had died after being thrown overboard by fellow passengers in the latest high-seas tragedy in the Mediterranean, as another 41 boat migrants were feared drowned in a separate incident. Police in the Sicilian port of Palermo said they had arrested 15 Muslim migrants suspected of attacking Christian passengers after a religious row on a boat headed for Italy, which is struggling to cope with a huge spike in illegal migrants arriving on its shores. The 12 victims were all Nigerians and Ghanaians while the 15 suspects came from Senegal, Mali and Ivory Coast. They were charged with “multiple aggravated murder motivated by religious hate,” according to a police statement. Distraught survivors, who set off from Libya on Tuesday before being rescued by an Italian vessel on Wednesday, told a “dreadful” story of “forcefully resisting attempts to drown them, forming a veritable human chain in some cases,” police said. In another drama, 41 migrants were missing feared drowned on after their dinghy sank en route to Italy, the International Organization for Migration (IOM) said, mere days after 400 migrants are believed to have died in another shipwreck off the coast of Libya. The four survivors in Thursday’s shipwreck, who came from Nigeria, Ghana and Niger, said their boat sank after setting sail from Libya with 45 people on board. Their vessel was spotted by a plane, which alerted the Italian coastguard, but by the time a navy ship arrived to help them only four passengers were found alive. The latest deaths bring the number of migrants killed while trying to cross the Mediterranean this year up to 900, the IOM said, up from 96 between January and April last year. The agency said some 10,000 people had been rescued off Italy since Friday alone, with recent good weather prompting a spike in the number of boat migrants attempting the risky crossing, many of them fleeing conflict and poverty in Africa and the Middle East. The flood of people trying to reach Italy in recent days has been “extraordinary”, IOM’s Giovanni Abbate told AFP in the Sicilian port of Augusta, where more new arrivals were disembarking. Driven by desperation and undertaking a perilous journey, he said it was not the first time disputes between migrants on packed boats had turned deadly, in reference to the 12 Christians allegedly thrown overboard. “Terrible tensions can arise, anything can happen,” he said. The IOM in a statement said it had received reports of “a fight between different groups -– maybe for religious reasons… on one of the boats rescued some days ago”. Nigerian and Ghanaian survivors told police a group of Muslim passengers on the boat, which was carrying around 100 people, began threatening the Nigerians and Ghanaians after they declared themselves to be Christians. “The threats then materialised and 12 people, all Nigerian and Ghanaian, are believed to have drowned in the Mediterranean,” the police statement added. Italy pleaded for more help Thursday from other European Union countries to rescue the migrants and share the burden of accommodating them. Italy is not the final destination for most of those who risk their lives each year in search of a better life in Europe, but as their first port of call it is saddled with handling all asylum requests as well as saving those in danger from a watery grave. “Ninety percent of the cost of the patrol and sea rescue operations are falling on our shoulders, and we have not had an adequate response from the EU,” Foreign Minister Paolo Gentiloni told the daily Corriere della Sera. “Then there is the difficult issue of knowing where to send those rescued at sea — to the nearest port? To the country where their boat came from? The EU has to respond clearly to these questions,” Gentiloni said. The crisis is only expected to intensify, with the Red Cross predicting record numbers of boat migrants this year. “The flow is unstoppable, and we, the international community, are failing to deliver on our commitments,” said Francesco Rocca, president of the Italian Red Cross. Amnesty International said it had been raising the alarm “for months” and urged European leaders to take action. “A season of death is now upon us,” said Gauri van Gulik, the rights group’s deputy Europe and Central Asia programme director. African asylum seekers say they are being threatened by the Israeli government with deportation to unsafe countries. Some African asylum seekers being held in detention in Israel have said they are being threatened with deportation to unsafe countries. Written notices given to some Eritreans held in deportation camps said they will be deported to unnamed African countries, thought to be Uganda and Rwanda. Al Jazeera’s Nisreen El-Shamayleh reports from the Negev region in southern Israel, where deportation notices are being handed to inmates in the Holot detention centre. ፖለቲካዊ ቤት ጽሕፈት ኤርትራዊ ዲሞክራሲያዊ ኪዳን 5ይ ስሩዕ ኣኼባኡ ጀሚሩ..ክፍሊ ዜና ኤርትራዊ ዲሞክራስያዊ ኪዳን 16 ለካቲት 2015 . 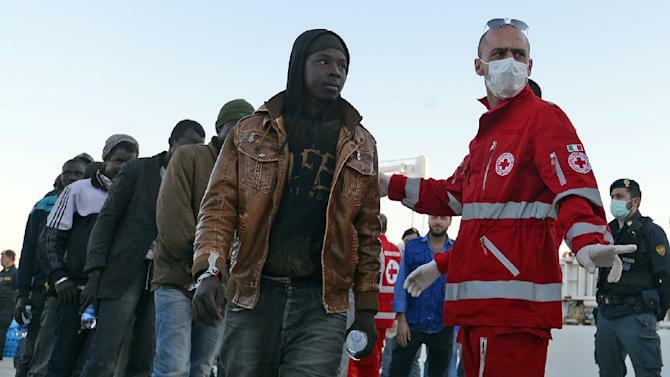 Three more boats containing a total of 1,150 Eritrean and Ethiopian migrants are headed to Italy after sailing from the Libyan coast last night, an Eritrean activist and an aid organisation have toldIBTimes UK. The latest wave of refugees set out after as many as 400 migrants fleeing Libya are feared to have drowned when their boat capsized 24 hours after departing the North African coast. Italy’s coastguard has rescued 144 people but several hundred others are feared dead given the size of the vessel. Sweden-based Eritrean rights activist Meron Estefanos said three boats with roughly 380 migrants each, mostly Eritreans and Ethiopians, left Libya last night. “The majority of them are women and children,” she said. The report was confirmed by the authoritative charity Caritas in Palermo, Sicily, which provides first aid and assistance to the refugees rescued at sea. “Three boats with 365 migrants each are approaching Italy,” a Caritas spokesperson told IBTimes UK. The latest tragedy that hit desperate migrants willing to risk their lives in a perilous voyage at sea has prompted calls for EU leaders to restore search-and-rescue operations in the Mediterranean Sea. Italy’s Mare Nostrum programme, which saved 150,000 lives in 2014, was ended in November due to lack of funds. Considered unsustainable, it was replaced with a “border protection” operation named Triton and managed by Frontex, the European border agency. Frontex’s annual budget has declined from €94m to €89m (£67.6m to £64m), which is paltry compared to the €10m spent monthly by Italy for Mare Nostrum. Over the years Estefanos, who is also a radio presenter in Sweden for Radio Erena, has become the voice of Eritrean refugees escaping the authoritarian regime of Isaias Afewerki and the compulsory military service in the country. Ahead of the latest tragedy, she received several phone calls on 12 April from migrants in distress at sea. “They called me saying the boat motor was not working and they ran out of petrol,” she said. The activist immediately alerted the Italian coastguard about the emergency and gave them the location of the boat. Rescue teams were reportedly sent to the boat in distress but it is unclear whether the migrant boat made it to Italy. Flavio Di Giacomo, IOM Rome spokesperson, told IBTimes UK that the migration numbers are more or less similar to 2014 – but the main difference is that Mare Nostrum rescue programme is no longer in place. “Rescuers have told us that they are quite worried because there are too many boats that need to be rescued. They hope to save them all but it won’t be easy because there are too many and the means are not the same as last year when the Mare Nostrum was in place. This is why we have experienced this dramatic shipwreck of hundreds of people,” he said.